Five new HP laptops are heading to the Miller Middle School language arts department thanks to a grant from the EMC Insurance Foundation. 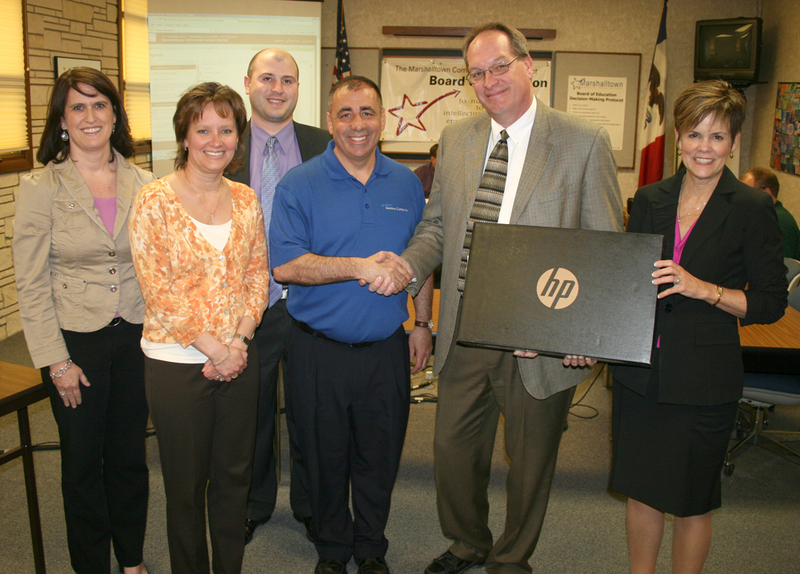 Representatives from EMC were on hand Monday night to present the laptops to the district and be recognized for their contribution. For the fifth consecutive year, Marshalltown High School is sending students to the National Forensics League national championship. MHS juniors Abby Snyder and Ilene Finn will represent MHS and Iowa in Birmingham, Alabama, this June. Both will compete in Legislative Debate. This is Finn’s first year qualifying for nationals, while Snyder’s third – she has qualified each year she’s been in high school. Dr. Janelle Hawk, who leads the forensics program, said they are actively fundraising to support the trip. She said there are many students active in the program and there are many young students who are showing promise. Read more about Abby and Ilene’s road to nationals here. The Marshalltown High School concert bands will compete in the 2014 Worlds of Fun Festival of Bands held in Kansas City, Mo. Bret Lee, director of bands, told the Board the band likes to take a regional trip in between the major national trips every four years. He said they like to make sure the trip is for a competition and is within driving distance. Students will need to pay a $50 deposit by early June for the trip, with the remainder of funds coming from the annual pasta dinner, fruit sales and other fundraisers. He said they always make provisions for students who work hard at fundraising but fall short, so no one is unable to go because of lack of funds. At the Festival of Bands MHS will have two concert bands compete. Results from the 2013 Iowa Assessments are in and the scores show both progress and areas for improvement. Dr. Susan Pecinovsky, associate superintendent for student achievement, said the District received the results about a week ago and is in the preliminary stages of analyzing them. She presented District-level scores to the Board according to the reporting calendar in the Strategic Action Plan. In reading, fourth, eighth and eleventh grade all saw growth from 2011-2012, though only fourth grade met the projected gains in the SAP. In math, eighth grade met the projections. Among students scoring in the “advanced” range on the Iowa Assessments, the District saw gains in reading at all levels, meeting all SAP projections. Projections were not met in math. The District also met the projection for college and career readiness in reading, but not in math. “In reading we seem to be on a more positive trend than in math,” Pecinovsky said. Pecinovsky also noted the District is starting to see more English Language Learners scoring in the “advanced” range. In the area of non-proficient students making more than a year’s growth in a year’s time, the 2012-2013 scores are baseline. Since the new Iowa Assessments were only implemented last year, growth projections couldn’t be made until after this year. Pecinovsky said the next steps are to delve into the data and determine what areas are lacking and how the District can continue growth where it is seen and improve it where it’s missing. This may involve a work session with the Board at a later date. The first step of the Roundhouse renovation will be replacing the roof. The project, which will cost an estimated $475,000, will go to bid in May, with formal bid awards on June 3. The substantial completion date of the project is Aug. 20, 2013. Garling Construction of Belle Plaine will complete the Miller Middle School 1957 classroom remodeling. Garling’s bid of $1,711,000 includes three alternates: added fire membrane, air conditioning and vinyl composition flooring. Substantial completion date for the classrooms and lower level restrooms is Aug. 16, 2013. Completion date for thee main and upper level restrooms is Jan. 4, 2014. Price Industrial Electrical, Inc., from Hiawatha will complete the medium voltage electrical upgrades at Marshalltown High School. Price was the only company to submit a bid for the project, which came in $400,000 over architect estimates at $1,428,605. With the addition of an alternate for an information technology generator, the project with cost $1,494,330. Several Board members were concerned with the high cost compared to architect estimates. Board president Sherm Welker said the Design Advisory Committee had the same concerns, but felt waiting another year to do the bid process would not result in substantial savings. To monitor the quality of education provided to our students MSCD collects data on a number of indicators including the percent of high school students taking college level coursework, attendance and graduation rates, and Iowa Assessments results (as reported during the board meeting). Our 2013 Iowa Assessments results provide us with reason to celebrate and cause for concern. Analysis of the results should also contribute to better alignment of curriculum, instruction and assessment that will ultimately benefit students. I am confident our attention-to-detail in this analysis/adjustment process will lead to continued increases in student achievement. Tonight the Board moved forward on several new building projects. We have much to do, as Miller will be undergoing new restrooms and classroom renovations to the 1957 wing (above the cafeteria). Support Services (old Anson Middle School) will have the upper floors remodeled to further the move of our District Administration to this new location. Marshalltown High School will start new lab classrooms for Project Lead the Way, roofing on the Roundhouse, high voltage power renovations for the entire campus, and the start of the major Roundhouse renovations this fall. Most of these projects have been on the capital improvement plan for many years back to “pre-bond issue” dates of the late 1990s and early 2000s. These building needs were assessed and listed long before the terms of the current Board members, much of the Administration team, and many of the MCSD staff. It is reassuring to know that we are continuing to building our district as those before us had planned, and all share the responsibility of providing excellence in building environments and programs, opportunities for our students and staff, and pride in our community. 405.8 Evaluation, rewritten according to IASB policy, waive second reading. 405.10 Access to Buildings, added keycards to language, waive second reading. PERSONNEL – Click here (PDF). April is School Library Month, so the teacher librarians of Marshalltown Community School District came to the Board meeting Monday to share some of the ways they connect students with books, learning and the larger community. In just the first semester students visited the school libraries 40,000 times, checking out 91,000 items. Teacher librarians have started before and after school reading programs, held library sleep-overs, and helped students use technology in learning. Each librarian told the board about specific events and programs started at their schools. Marshalltown’s teacher librarians are Sue Inhelder (MHS), David Stanfield (Miller), Erin Feingold (Lenihan), Jeni Sloan (Hoglan), Beth Steffa (Anson), Alicia Patten (Fisher), John Fritz (Franklin), Ellen Youds (Rogers) and Sue Cahill (Woodbury). Ronnie Manis will be the next principal at Anson Elementary School starting July 1, 2013. The report from the Department of Education is overwhelmingly positive after a Site Visit Jan. 15-17, 2013. Dr. Susan Pecinovsky, associate superintendent for student achievement, presented a summary of the formal Site Visit report, which noted strengths and recommendations in seven categories: Vision, Mission & Goals; Leadership; Collaborative Relationships; Learning Environment; Curriculum & Instruction; Professional Development; Monitoring and Accountability. The district had three areas of non-compliance, which have been corrected and submitted to the Department of Education. Dr. Pecinovsky said as of the Board meeting Monday the District was in complete compliance. To view the Site Visit Summary presentation, click here. The Board approved the District budget for 2013-2014 Monday. The budget is based on zero percent allowable growth and the 1 percent budget guarantee. Since the state legislature has not set allowable growth for the next year, the budget is based on “worst case scenario”. Finance Director Kevin Posekany told the Board this uncertainty was also the reason for a 30-cent increase per $1000 valuation in property taxes to $17.84. He said the Board could always go back and reduce the tax levy after the state sets allowable growth, but they cannot go back and increase them, which is why it is set higher to start. He told the Board once allowable growth is set they should be able to reduce the tax levy back to 2012-2013 levels. The Board of Education’s approval of the fiscal year 2014 budget was another step in the process of clarifying how monies to be received during the 2013-2014 school year will be spent. Among the factors included in these allocation decisions are district priorities, board policy, and current knowledge of federal and state funding levels. Now that the budget has been adopted, the next step is to align expenditures with district priorities, without changing the total to be expended. These adjustments will be made between now and the end of June based upon factors such as curricular needs, compensation packages and operational costs (e.g. utilities and transportation fuel). Reports will be made about these adjustments as additional information becomes available regarding changes in state revenue and district commitments for 2013-2014. We had been given a verbal report when the team completed the inspection and all of the points were confirmed by the written report. It is my privilege to summarize the results and say the Marshalltown School District passed with flying colors! The inspection team remarked that all members of our team know and understand the implementation of the Strategic Action Plan and the measurements that enable the Board, administration, and staff to monitor our progress. There are many facets to encourage and motivate student achievement, and the SAP identifies our plan and our results. We are very pleased that only a few minor paperwork / policy issues were needing adjustment as a result of the inspection and those items were all corrected in February after they were identified. Marshalltown is in full compliance and ready to grow and advance as we have planned. Thank you to all parties involved with the Site Visit and our progress. We look forward to all of the opportunities the future will bring here in Marshalltown. 405.3 Licensed Employee Individual Contracts, waive second reading. 405.6 Certification, mark reviewed with citation of Iowa Code. 405.7 Assignment and Transfer, mark reviewed with citation of Iowa Code. 405.8 Evaluation, bring back revisions based on IASB policy. 405.10 Access to Buildings, rewrite to align with current practices.